Nokian Tire invented the All-weather tire category with their revolutionary WR lineup of 4-season tires that carry the winter Severe Service rating. 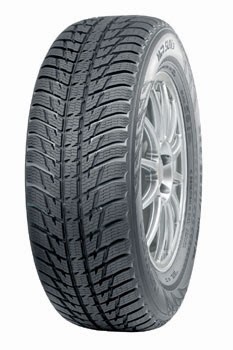 These tires combine the snow performance of a dedicated winter tire with the convenience of a traditional all-season. The Nokian WR and WRG2 passenger and SUV models have won accolades from critics and drivers alike. Never ones to rest on their laurels, the Finnish tire company has introduced the latest in the all-weather lineup, the WRG3 SUV. Building on the experience from the WR SUV and the WRG2 SUV, Nokian has once again raised the bar with an innovative tread design that features polished transverse grooves to disperse water and slush quickly. The arrowhead shaped tread design improves wet handling and the ever-important fuel economy for larger SUVs and crossovers. Drivers in northern climates don't need to choose between winter performance and the convenience of using a single tire, with the WRG3 SUV they can forget the forecast!